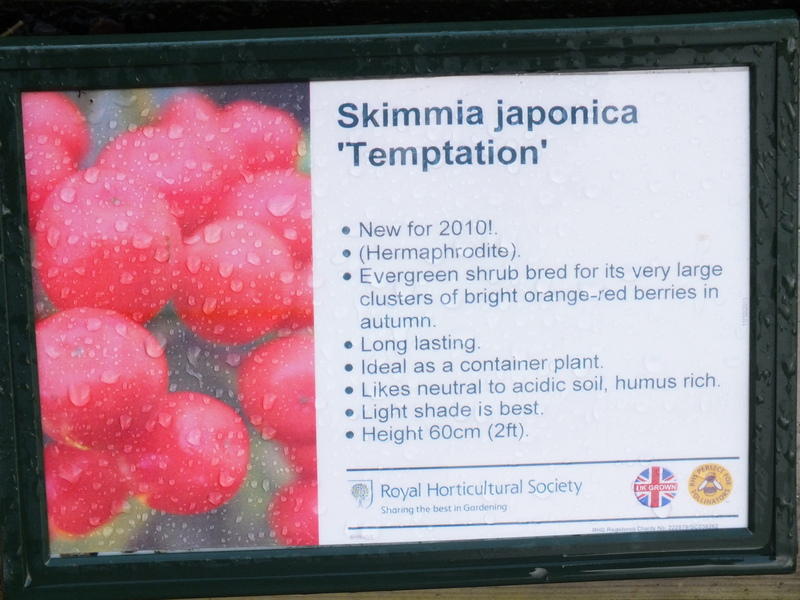 Hermaphrodite Skimmias offer, if it needs to be said, the best of both worlds – self-fertile plants with flower and fruit. Here are two – Skimmia japonica Temptation and a form of Skimmia japonica subsp. reveesiana – Chilan Choice. Admittedly the flowers are not the Main Event that they are with, say, Skimmia rubella or the very classy Skimmia Kew Green (which is male), but the guaranteed display of bright red fruit must ensure there is room in many gardens for this small evergreen shrub. I seem to remember there is another self-fertile cultivar called Obsession, which will have flowers followed by a guaranteed display of bright red berries. Perhaps a slightly larger plant when mature, but worth seeking out. 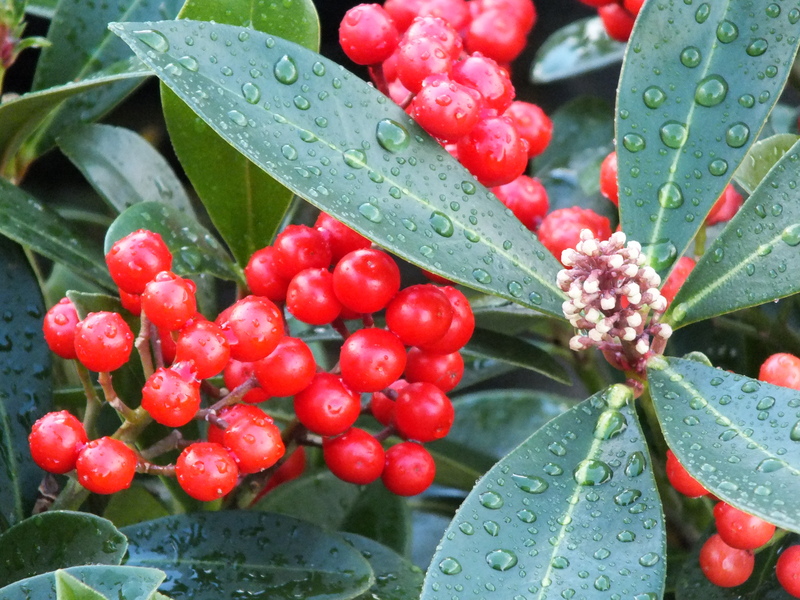 Skimmias are valuable evergreens with two seasons of interest: spring flowers and winter berries. But, mostly, they come in male and female varieties so that you need two different plants, one of each, to ensure that those bright scarlet berries are produced on just one of them. ‘Temptation’ is different. The plants are self-fertile, only one plant is needed for the fruit to develop, so all plants of ‘Temptation’ produce berries without another plant nearby for pollination. The other problem with some of the older varieties is that although they may start small, they eventually become uncomfortably tall for many modern gardens. ‘Tempation’ is shorter, and more bushy, so makes a more effective garden plant. Its root growth is strong, unlike the other self-fertile form, S. japonica subsp. 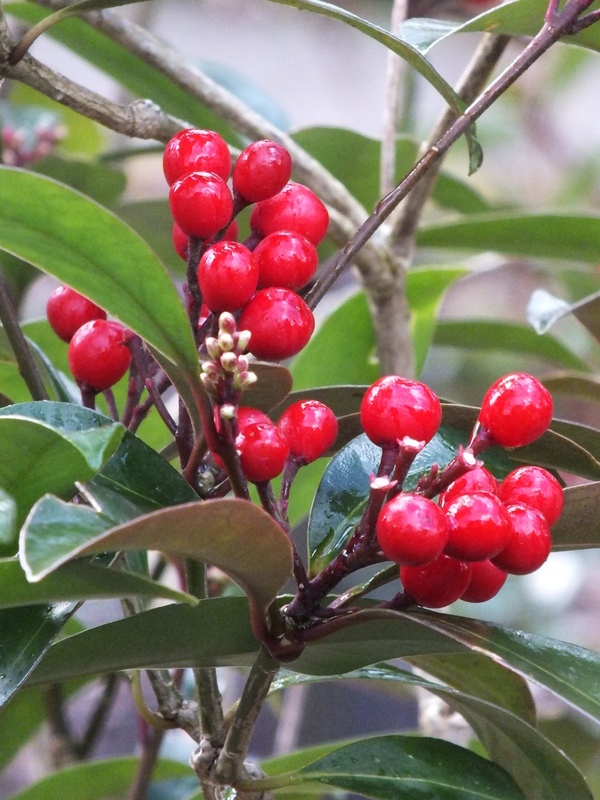 reevesiana, and its berries are a much brighter red. 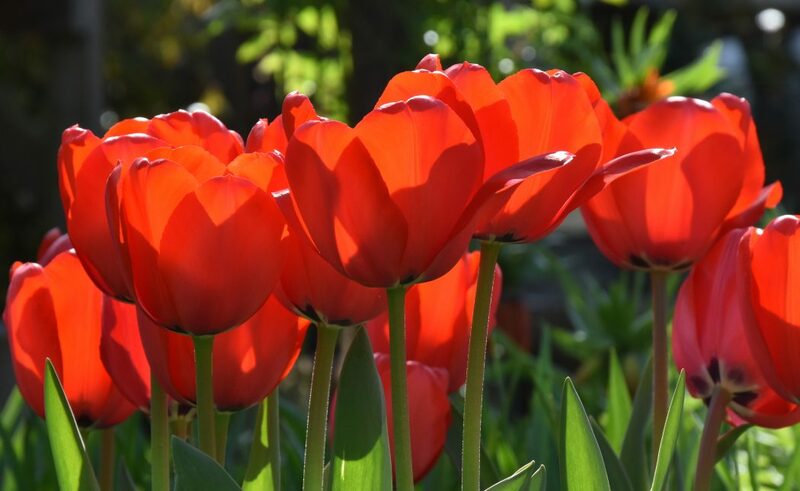 ‘Temptation’ is the result of more than twenty years of careful selection at Wageningen University in Holland where it was picked out by breeder Margaret Hop in 2005. ‘Temptation’ is sufficiently compact to make a good two season container plant, and also thrives in any fairly well-drained garden soil in sun or partial shade. which is required reading I think, and has contributed greatly to the horticultural canon.